THIS PROPERTY HAS FREE WIRELESS HIGH SPEED INTERENT. 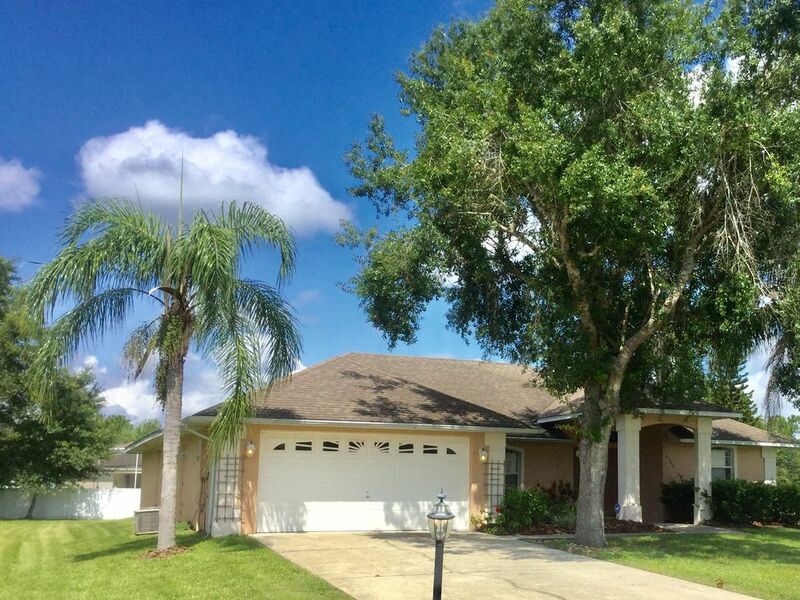 This 4 bedroom pool home is located on a 1/4 acre corner plot in Doral Woods, a small, rural and tree lined development off Poinciana Boulevard, Kissimmee that is free from the overcrowding associated with many of the new short term rental locations around the Orlando area. The Property is well equipped, clean and comfortable, a great place to either rest at the end of a hard day at a theme parks or simply hang out and relax all day by your own pool, or use the on site Tennis courts and community pool. Many visitors return to Doral Woods year after year - We have 6 properties to rent in Doral Woods - of all the areas we rent in Kissimmee - Doral Woods books up first. No Pets - smoking allowed only out by the pool/patio screend in area. The home has been furnished to accomodate all of a vacationers needs, built on a large lot, plus the pool has privacy lanscaping, and a lanai (so you don't have to be out in the sun all the time), out side dining table and chairs, loungers and extra chairs to chat and catch up on the days events - plus a gas BBQ can be rented if required - 3 sizes, michell will check with you if needed. The pool can be solar heated or elcetric heated for the cooler months. The decor is light, stylish and color co- ordinated. The home is under a 24 hours management program, licensed by the state of florida. Doral woods also has a community pool. The house has it's own private pool. WHEN YOU PICTURE LIVING IN FLORIDA ,THIS IS IT!! I loved this place,felt like home! My family and I didn't want to leave, the pool,the accomadations,It was very welcoming.Michelle made it really easy for us to understand the house. BEDS were comfortable in all rooms. POTS PANS UTENSILS ETC. I can't even say enough about this home, One thing is for sure, We will be back! !Thank you so much Michelle for the communication and the hospitality,very much appreciated!! This is a beautiful home. Every room was spotlessly clean, both bathrooms were furnished with endless towels, facecloths, etc. The kitchen contained every gadget needed and the cupboards were filled with new cookware, glassware, place settings, and a drawer filled with every kind of knife and utensil. There were smoke alarms in every room, the furniture was clean and well-cared for, the beds were beautifully made with high quality bedding, tv in almost every room. The pool was clean and heated, the area around the pool was well furnished with a large table and plenty of outdoor furniture. Excellent place to relax and enjoy the clean surroundings. It seemed to be furnished with every possible convenience to the renter. My wife and I had a great time. The home is a little dated but that made it the more at home feeling as you where not on edge to sit and watch TV or have dinner at the dining room table. the pool was a great relief for the hot days and the heating of the pool made the cold days easer to enjoy. The villa was a fantastic size for our party, which consisted of 4 adults and 2 children. Everything was as described and communication with Michelle was great. Would def consider staying there again. The home has pretty much everything a family on vacation needs. Retrieving the key, managing security were easy. Home was welcoming. The bedding, carpet, towels etc are old and need to be replaced. The kitchen had everything to our delight. It is time to have a small instant pot in the rental homes now. Landscaping can use a face lift. Over all a great stay. Good property for a family get away. The house provided everything we were looking for. It was very comfortable, clean, well equipped and secure. It's location is in a very quiet area away from the hustle of city life, but not too far from "civilisation" to be a bore. It had decent rooming accommodations and provided the space and freedom not always afforded at hotels. The distance to the theme parks is approx 30 - 35 mins drive. Laundry equipment was quite reliable. Also, more than sufficient cutlery was provided for varying cooking requirements. The pool was quite warm from the solar panels with no need for additional heating. If I had to be picky, only improvement recommended would be the addition of a 'safe' for good measure. The representative (Michelle) for the house was quite polite and answered any question/query in a timely manner. Doral Woods is often choosen for a quiet relaxing vacation, still close to Disney (15/20 mins), but ideal for those whom wish to spend more time visiting other areas. All the theme parks are a short drive - including Universal studios and Islands of Adventure - check out Aquatica and Discovery cove! There is a The 7 Eleven gas/convenience store is 2 mins away from the hosue , or more substantial grocery shopping- Publix or Wal-Mart, Pizza, chineese take out, liquor, Taco bell, Mac Donalds, KFC, are 5 mins away. Solivita, and The Oaks golf club plus numerous other courses are near by, Horseback/trail riding, Nature Consevacy trails, Kissimmee Lakefront Park with boat trips, rentals, fun water fountains, childrens play ground etc, Visit Kennedy Space centre and Cocoa Beach 1 hour away, St Petersburgh and Cearwater are a 1 and 1/2 hour drive, check our guest reviews! If you wish to book, we are a preferred partner, offering Homeaway payments. Most guests prefer the option to not pay a refundable damage deposit of $200 but take out the damage protection policy for $59. If this does not suit your group - just e-mail Michelle. Please note any pool heat is extra, $105 per week - separate line on the quote. If you instant book Michelle will e-mail you to check if you wish to add the pool heat.